I was given the opportunity to snap the first precious moments of this story at the airport, where the groom Dimitri welcomed his mother who flew in to Denver, Colorado for her son’s wedding. They hadn’t seen each other in several years.. It was a sunny August day when we arrived at Manitou Springs, known for its healing waters the Ute Indians have been drinking for generations. However, I came to find the wedding party partaking in healing waters of a different kind at the local bar, before they both went their separate ways for their respective Hen and Bachelor parties. It was a delightful evening and by the looks of it, the boys had the better fun! Perhaps a little more “healing water” than the ladies? The wedding preparations took place at a remarkable Inn in Manitu Springs where I heard Santa himself was a permanent member of staff! With that, I just had to find the mysterious man myself! A favourite of mine in this unit is the photograph of the wedding rings through the fishing line, taken in front of Dimitri’s favourite GS. At the Garden of Gods park it all came together. There are no words to describe the choice of that amazing location. Unique and sensational! A personal choice of the bride and groom inspired by their passion for adventure and rock climbing, as well as each other! Dimitris wished to add a greek touch with the addition of the wedding-crowns to symbolise the unity of marriage. To the King and Queen of this Coupledom! 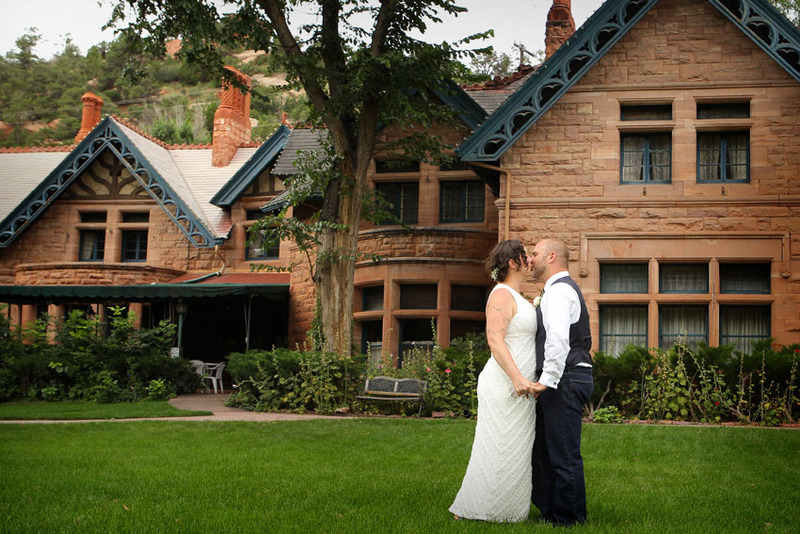 The wedding reception took place at a Victorian English House, Briarhurst just 5′ from Garden of the Gods main Park. It is also known as William A. Bell House, a Colorado businessman and renowned photographer of the Amercian West who was also the founder of Colorado and Manitu Springs. The knowledgeable and accommodating manager Mrs Janice Montoya gave us a superb insight into the 200 year old history of this extraordinary building. The next day of the wedding we embarked for another photo-shoot. Main theme? Bikes! What else? And as in the state of Colorado a helmet is not compulsory, we did take advantage. Left the Garden of Gods accompanied by the dulcet tones of a boxer engine! An hour later we swapped from bikes to cars to reach the top of Pikes Peak mountain one of the highest in the US, 10 miles west of Colorado Springs. The difficulty breathing was overwhelming, although not entirely a surprise, as the oxygen levels at 14,111ft are considerably low. We completed the photo-shoot at the very centre of Manitu Springs and yes, close to Garden of the Gods I’ve also found Santa who was keen to pose for a portrait! An unforgettable experience! A joy to photograph. My warmest heartfelt wishes to both of you! These are fantastic and so much fun!! I chose my wedding photographer years before I chose my wife. And I regret nothing! Nek was so funny and easy to work with. He was able to capture my wife’s and my unique character so great! I am so glad and honored we are the first couple in the US you were able to photograph! Karin, I, our friends and family are amazed by your talent. Thank you! Thank you so much! it was an absolute pleasure and we are so pleased that you loved the pictures as much as we enjoyed taking them!Our best wishes!